Academy Games, the maker of 1775 Rebellion, is among the top game publishers in the country. Their entire line of board games are challenging, educational and intelligent. One can learn a great deal of historical relevance from each game. The 1775 Rebellion game is a very good case in point. The board consists of a depiction of the original 13 colonies, stretched diagonally to include parts of Canada that were significant in the Revolutionary War. The playing pieces are colored to represent the four fighting factions – the British Regular Army, and the Loyalist Militia; the Continental Army, and the Patriot Militia. Each side has an ally force as well – the British have the Hessians, German mercenaries, and the Americans have the French, who were congenital enemies of the British and eager to aid the American cause. There are also units of Native Americans, who can be allied with either major force. Each faction has its own set of cards – Movement and Event cards that are used in a player’s turn. When playing with fewer than four, each of two players controls more than one faction and ally. There are special cards, dice and the colored “units” or “men” to place. The board already has certain designations for placing one’s units and to begin, each side controls certain areas – the British control Delaware, Quebec and Nova Scotia; the Americans control Connecticut and Rhode Island. There are colonies that contain placements for both sides as well. There are 3 play scenarios to choose from: The short version, the “Introductory Scenario” (1/2 hour, approximately); the “1775 Campaign” and “the Siege of Quebec”. The game consists of a variety of Rounds. Each round includes a turn taken by each faction that is determined randomly by drawing one of four colored Turn Markers from a cloth Draw Bag. The color of the drawn Turn Marker determines which faction’s turn it is. After all turn markers have been drawn and all four factions have had a turn, the Round is over. The Round Marker is moved to the next Round circle on the board and play continues. A player’s turn consists of performing various actions in a sequence set forth in the Game Manual. Battle Dice are rolled to create Hit, Flee or Command Decisions. The warring factions respond to the roll of the dice and that, along with some strategic decisions, determines the course and outcome of the game. 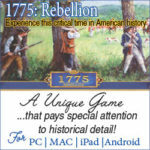 1775 Rebellion is a complex game, but intriguing and historically accurate, so playing it gives intelligent information about the actual occurrences of this most-important period of our history. The game is also available to play on a PC, Mac, iPad and Android. Visit the website, https://www.academygames.com/ and be sure to check out their other tantalizing and mindful games – Fief, France 1429, a game of Medieval politics; the Viking Invasions of England; Conflict of Heroes series and many more! E.S.